If you are a DC Comics fan, today the Internet split in half and revealed a heavenly vision: all 12 of the variant White Lantern covers joined together. And just as some thought, when pieced together, the image appears to be inspired a bit by the Sistine Chapel. Instead of Bible Genesis, you have DC Universe Genesis, with the Ring-entities from Green Lantern providing the magic. Let's look at this magnificent image from a few different angles. Ryan Sook, along with Fernando Pasarin and Joel Gomez, knocked themselves out here. If I had to pick my favorite single covers out of this set, it would be the Hawkman cover from Justice Society of America 42. There is something I love about the regal pose (worthy of an Egyptian King) and the detail on those feathers. 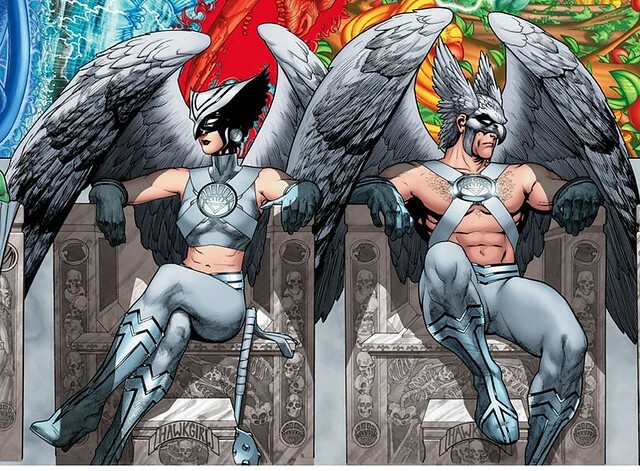 When you join this together with Hawkwoman from the other cover, it is even more impressive. Here is the entire poster joined together, courtesy of DC Comics The Source blog. I am sure this is a no-brainer to make this image into a poster. I will buy it on place it up on the ceiling of my garage. Whenever my wife speaks in the garage from that time forward, I will shout SILENCIO! Just like the guards do at the Vatican. And after I do that, I will be living in the garage for the rest of my adult life. Here's one row of the White Lantern characters seated: J'onn J'onzz, Hawkwoman, Hawkman, Firestorm, and Hawk. A lot of people are taking note of the entities behind each character, such as Blue for J'onn J'onnz and Red for Hawkwoman. Does it really mean something? I take more meaning from the fact that all these guys lined up are the heroes. On the flip side, we have Maxwell Lord, Osiris, Professor Zoom Reverse Flash, Jade, and Captain Boomerang. Clearly, all of these are real evil characters, except for Jade. But if I had to guess, I would say that she could turn bad, too. Her posture is very strange. On the left side of the poster, we have Deadman, holding the White Ring in his fist, a really nice pose that Sook came up with for the character. 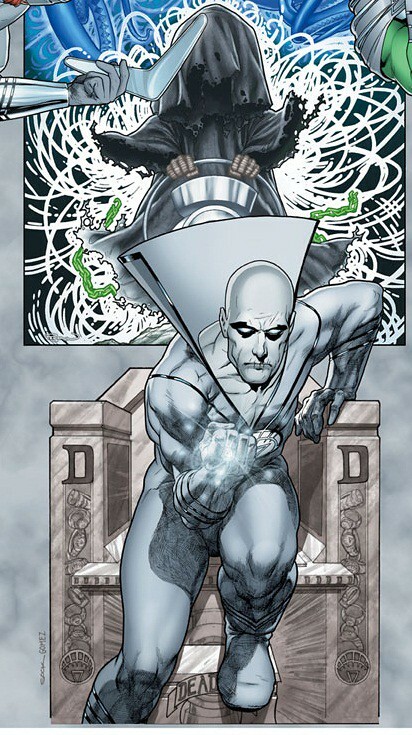 On top of Deadman there is the evil Guardian midget dude (sorry, haven't read this month's comics yet if his identity was revealed) who is stealing all the Ring entities. It's pretty clear that he would love to steal the White Lantern entity, too. 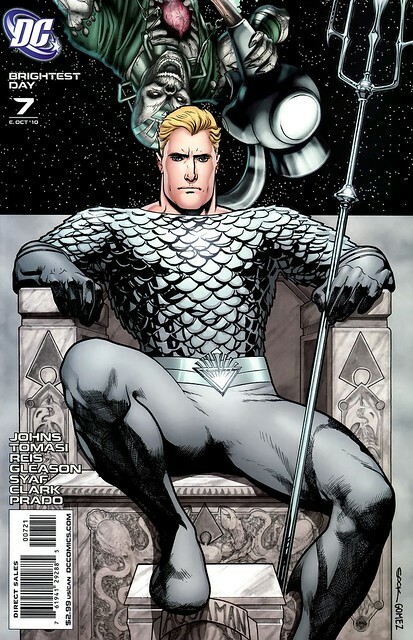 On the opposite end from Deadman, we have Aquaman. You have to dig a guy who can wear all that chain mail in the ocean. Nekron, the villain of Blackest Day, hangs ominously over the Atlantean prince. "THIS JUST GAVE ME THE BIGGEST FANGASM OF MY LIFE! " Couldn't have said it better myself, buddy. Nuff Said!